Who would have thought chemotherapy would be something to look forward to? For Lesley Hedlund and Beth Tate, who met undergoing chemotherapy for breast cancer in 2015, an introduction from a nurse they had in common would initiate a deep friendship that made going to chemo “something to look forward to.” Their special bond, with additional commonality in shared Swedish heritage and Chicago backgrounds, continues long after their last treatments. 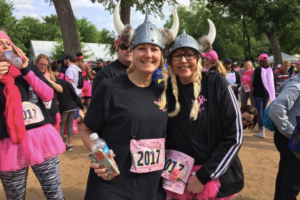 These roots are reflected in their formation of a colorful Susan G. Komen Greater Fort Worth Race for the Cure team called “Slåss som en tjej,” Swedish for “Fight like a girl.” It debuted in 2016 with some 28 friends and family members, Viking-themed attire and tailgate fare, and most importantly, a fund-raising total that placed it as one of the top teams in the race. The team finished the 5K as a group, crossing the finish line together. This year the team has grown to more than 30 members and the captains expect once again to be top fundraisers.